He is an architect turned Indian bowler who has taken Indian domestic cricket to greater heights. He used to play Cricket in his childhood but gave it up after being repeatedly rejected. He then went onto taking up architect as a profession but soon found that it wasn’t his calling. He quit his job and came back with all his ferocity to make cricket his full-time career. He then started playing with the Jubilee Cricket Club in the fourth division. His honed skills and expertise with the ball caught the attention of Chennai Super Kings and he was asked to bowl them in the nets. The rays of hope soon vanished as Chennai Super Kings home games moved to Pune. But the dark days didn’t last long either and there came support from Dinesh Karthik, skipper, Kolkata Knight Riders and Chakravarthy was once again asked to bowl them in the nets. He then came across West Indian spinner Sunil Narine and trained further with him. He then showcased his expertise and learnings with the ball in the Tamil Nadu Premier League (TNPL) held in 2018. His praiseworthy performance was appreciated by Mike Hussey, an Australian batsman. He made his List A debut by playing for team Tamil Nadu in 2018-19 Vijay Hazare Trophy. He left everyone spellbound with his 22 dismissals in 9 matches. He then played Ranji Trophy for Tamil Nadu in 2018. It is was revealed in one of the interviews that he possesses seven variations and can bowl legbreak, carrom ball, top-spinner, googly, flipper, offbreak, and a slider. Maybe that is the reason why he was picked up by Kings XI Punjab, owned by Preity Zinta, Ness Wadia, Karan Paul, Prithvi Raj Singh Oberoi and Mohit Burman. He was bought for an exuberant 8.4 crores. 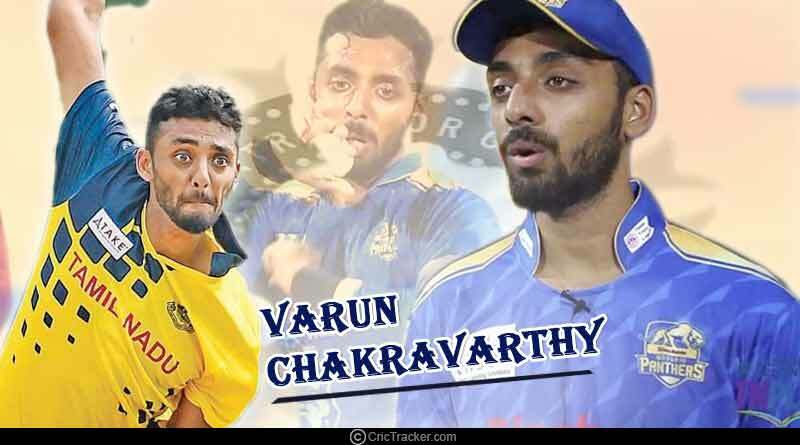 For more articles like ‘Varun Chakravarthy biography and facts’, do follow us on Facebook, Twitter, and Instagram.